The chart to the right measures the median stock’s correlation to the S&P 500. It attempts to gauge how much of a security’s movement is attributable to the “macro” wave. Not too long ago, it was a common complaint that stocks weren’t moving on their own merit, as 70%+ were trading in lockstep with the market. 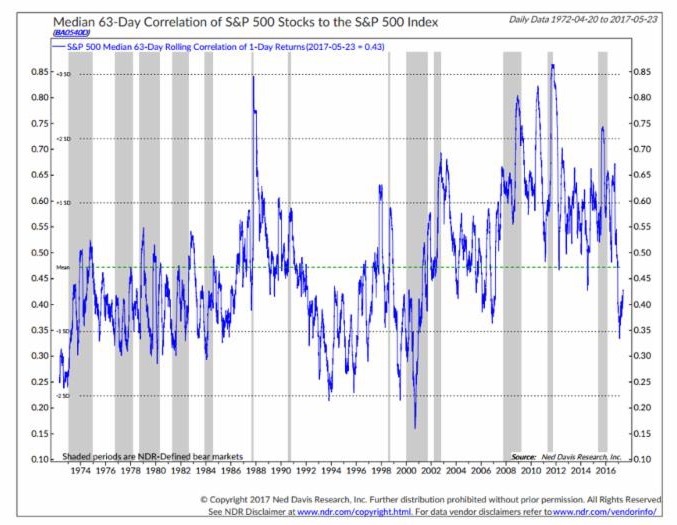 On the other hand, when correlations are low, or declining, market professionals will profess that we are in a stock picker’s market. No one is complaining about correlations this year, as dispersion has come back with a vengeance. 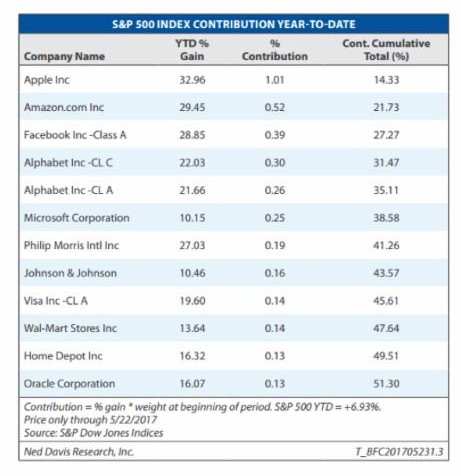 In fact, over half of the S&P 500 return year-to-date is attributable to only 12 stocks (see table on right). So the natural, “new” concern will eventually become the narrow breadth of the market. We believe this is simply a reversion back to the mean, where correlations normally remain between 35-60%. The abnormally high correlation levels seen in recent years were likely a byproduct of the most aggressive monetary policy in history, and we believe that part of the cycle is over. There will be much higher dispersion of returns if this new range is the norm. This will put a much higher emphasis on stock selection and sector attribution. The rising market tide may not lift all boats, which makes sense when you are this late in an economic cycle. Competition becomes fierce – just ask any retailer about the new kid on the block. Eleven names make up more than half the S&P 500 return. Periods of narrow leadership are not rare and can last for some time. Our message to investors is to stick with the leaders. Often when there is a shift in leadership the transition is not only difficult to predict, but also is accompanied by increased volatility. WhaleRock is an SEC registered investment advisor (RIA) headquartered in Providence, Rhode Island with clients throughout the United States. Founded on fiduciary principles, WhaleRock lends predictability to clients’ financial lives through a rules-based investment process, delivered with attentive service. With a policy tailored to each client, our ultimate goal is to achieve wealth preservation and accumulation over generations.